Six weeks after the Hanoi summit, South Korean President Moon Jae-in is about to visit Washington in an effort to keep up the dialogue between the United States and North Korea. Mr Moon’s April 11 trip will take place against a troubled backdrop, of North Korea’s threat to walk away from the nuclear talks as well as the US doubling-down its “all or nothing” approach. With both the US and North Korea showing no signs of acquiescence, Mr Moon’s role as a mediator is more important than ever, lest the collapse of the Hanoi summit spell the end of the denuclearisation process entirely. However, as much as Mr Moon’s mediating role has been emphasised to date, the limits of his shuttle diplomacy between the US and North Korea are also becoming clear. Since the 2018 Winter Olympics, Mr Moon has worked hard to bring the US and North Korean leaders to Singapore and Hanoi by travelling back and forth between both. Mr Moon has facilitated a Korean détente by signing the Pyongyang Joint Declaration to lower inter-Korean tensions and to consider potential South Korea’s investments in North Korea as a part of the denuclearisation process. He has also pushed for a phase-by-phase denuclearisation roadmap to minimise the differences between Pyongyang and Washington. Unfortunately, even though Mr Moon is in the driver’s seat of the rapprochement, he has no say as to its direction. This is due to South Korea being stuck between North Korea’s decoupling and the US counter-decoupling tactics – put simply, if North Korea seeks to undermine the US-South Korea alliance by pushing for the revival of inter-Korean economic projects, the US will respond by keeping its sanctions intact to restrain South Korea’s engagement with the North. North Korea has previously sought to use both hard and soft-decoupling to weaken the US-South Korea alliance (The peril of North Korea’s charm offensive). 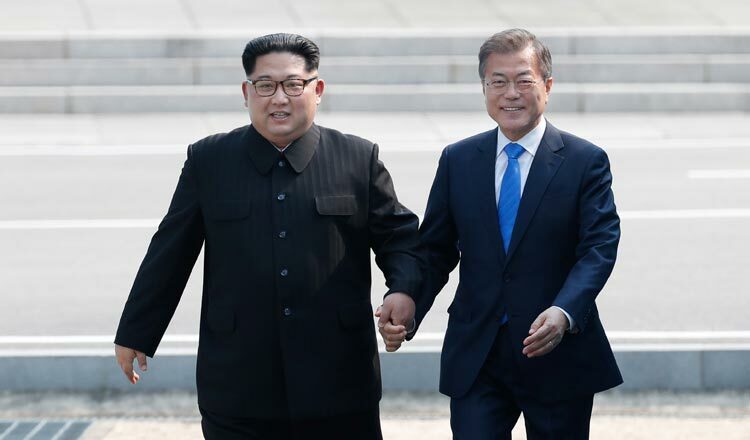 Under South Korean liberal presidents Kim Dae-jung (1998-2003) and Roh Moo-hyun (2003-08), North Korea used diplomacy and economic engagement to lower inter-Korean tension to invalidate the essence of the US defence commitment against the North Korean threat to Seoul. During periods of South Korean conservative presidents Lee Myung-bak (2008-13) and Park Geun-hye (2013-17), Pyongyang employed its nuclear tests and threats of imminent wars to make South Korea question Washington’s commitment to trade New York for Seoul in a nuclear conflict. In these cases, Washington often responded with its own counter-decoupling tactics. In response to North Korea’s soft-decoupling efforts during Mr Kim and Mr Roh’s years, Washington went along with Seoul’s plan to pursue dialogue with Pyongyang to avoid a major crack in the alliance. However, the US also kept sanctions intact and withheld any rewards in the absence of progress in North Korea’s denuclearisation to control the pace of the détente. Consequently, the Six-Party Talks revolved around how the US could provide sanctions relief in exchange for North Korea freezing and dismantling its nuclear and missile programs on a step-by-step basis. At the same time, the Bush administration was against Mr Roh’s plan to open the Kaesong Industrial Complex and Mount Kumgang Resort on the ground that these projects constituted rewards for North Korea. When North Korea used hard-decoupling during the Lee and Park presidencies, Washington responded to North Korea’s nuclear tests and threats of war by reaffirming the nuclear umbrella, sending US strategic assets to South Korea, and coordinating a “counterprovocation” plan with Seoul in case of North Korean aggression. These measures resulted in the delay of a mooted wartime operational command transfer, the placement of the Terminal High Altitude Area Defence system in South Korea, and closer US-South Korea cooperation in intelligence, surveillance, and reconnaissance capabilities. Apparently, as North Korea is using soft-decoupling towards the Moon administration, the US is again employing sanctions to control the pace of inter-Korean rapprochement while signalling its wish to continue dialogue with Pyongyang. South Korean businesses’ efforts to invest in North Korea may violate US sanctions, which deny entities trading with North Korea access to the US financial system. The Panmunjom Declaration also needs sanctions exemptions to be implemented. Importantly, as long as North Korea fails to completely denuclearise, the US is likely to put pressure on Mr Moon not to reopen Kaesong and Kumgang. Washington’s willingness to maintain dialogue indicates that it still supports the ongoing détente, but its control of sanctions gives it the final say over the pace and outcome of the process. For its part, North Korea understands that sanctions relief is the key to its soft-decoupling tactic because the relief will increase inter-Korean political and economic exchanges. Hence, even though current sanctions are not effective, North Korea still demanded such a relief during the Hanoi summit. The US and North Korea failure to reach a consensus on the scope of sanctions relief illustrates the centrality of sanctions in this tug-of-war over South Korea as well as Mr Moon’s incapability to manage the outcome despite him being the mediator. As Mr Moon heads to the US next week, he will seek to revamp the nuclear talks. However he cannot change the status quo while ever North Korea and the US are employing decoupling and counter-decoupling tactics against one another. The best Mr Moon can hope for after the next meeting with Mr Trump is the continuation of North Korea’s moratorium on missile and nuclear testing, and seek to ensure US patience for future talks with Pyongyang.